To look at Jeff Minier today, it is hard to imagine him as a floundering undergraduate struggling to make ends meet. These days, he exudes an air of success-a success that he has worked hard to achieve and one that he directly attributes to his time spent at SIUE. Today, Minier works as the director of Global Research and Business Intelligence at the Merial Corporation, a $2.2 billion dollar global animal health company. His position in the Atlanta, Ga., office is an international one that has him traveling around the world meeting with global brand directors. Minier's remarkable story, however, begins far from the exhilarating life of having lunch in Paris with his wife whom he, coincidentally, met at SIUE. Rather, it starts in Georgia where he studied as an undergraduate. A self-proclaimed "average student," Minier struggled financially and academically throughout college. After graduating from the University of Georgia in 1988, Minier ventured into the world of sales. For three years, he traveled the Midwest as a sales representative. As Minier explains, "It didn't take long for me to realize that being a salesman wasn't the life that I wanted. I decided that if I didn't want to stay in sales, I had to make a change." Hoping that going back to school would help him make that change, Minier quit his job as a sales rep and relocated to Alton, Ill., in 1995. He enrolled in SIUE's MBA program and soon found himself in Dr. Jack Kaikati's marketing research class. Over the course of the semester, Minier realized he had a knack for marketing research and learned of SIUE's Master of Marketing Research Program (MMR). It wasn't long before Minier left the MBA program and started working on his MMR degree. The MMR program turned out to be just the change Minier was looking for. He said, "When I came to SIUE, I was floundering. I didn't know what I wanted to do when I 'grew up'. The MMR program opened the door for me to succeed." Looking back on his years at SIUE, Minier notes that the program's personalized attention from professors like Dr. Ralph Giacobbe and Dr. Madhav Segal helped motivate, encourage, and challenge him. Minier explained that "these professors have a passion for what they are doing. They have a grander purpose in life-to educate and encourage their students." Minier's passion toward the MMR program is evident when one looks at his continued involvement at SIUE. Since his graduation in 1998, Minier has stepped in to help teach when professors have gone on sabbatical, participated in the MMR speaker series, and has worked with other MMR alumni to create the Frank Staggers Award of Excellence. More recently, Minier helped create the MMR Advisory Board, which is comprised of marketing research industry leaders from several leading research agencies and Fortune 500 client organizations. Minier is currently one of two MMR alumni on that board. "The creation of this board is evidence that marketing research executives see and recognize that the MMR program plays a crucial role in industry," he explained. This past fall, despite his global role at the Merial Corporation, Minier found time to be an integral member of the Event Planning Committee for the 20th Anniversary Celebration of the MMR program. Perhaps the best evidence of his commitment to the MMR program is the fact that at the 20th Anniversary Celebration, Minier received the "Distinguished Service Award" for his continued contributions to the program. Minier said it best, "All you need is that one person to push you, to challenge you, and that makes all the difference. 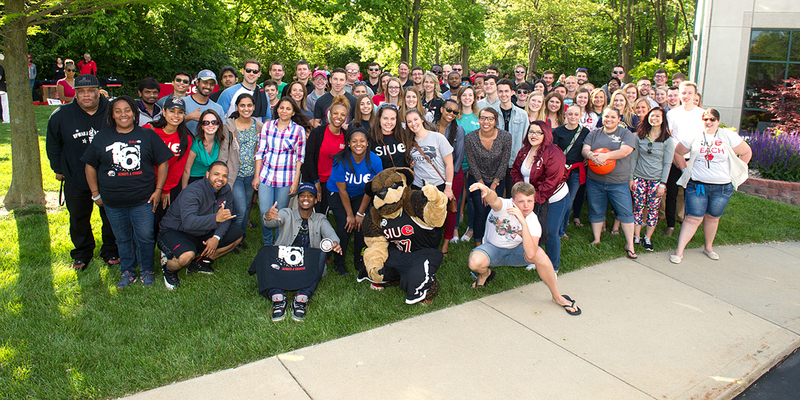 Enrolling in SIUE's MMR Program is absolutely the best decision I have ever made in my life."